Which technology would you like to use with SmartThings? This entry was posted in Blog, SmartThings on July 17, 2013 by Juan Risso. I will try to make it as simple as I can but please leave a comment if think that anything needs clarification. Go to preferences, inside the device, you will be able to enter your user, password and serial number for the Nest you wish to control. You can create more than one device using the same device type just make sure to enter the serial number for each. This entry was posted in Blog, SmartThings on July 16, 2013 by Juan Risso. I know from SmartThings forums and Office Hours that Nest Thermostat is one of the most requested devices for SmartThings so I decided to give it a try. I worked with Nest and a Raspberry Pi before, using a Python library, so I knew this integration was possible. Using gboudreau/nest-api I was able to connect to my Nest account, trigger actions and get reports from the device. Finally, the only thing left was defining the device type. “Z-Wave Thermostat” was the perfect starting point. Basically, I replaced the Z-Wave actions with calls to the API. Hope you like it. Looking forward to bring this integration to everyone as soon as possible. Please contact me or leave a comment if you have any question on how to integrate your Nest Thermostat. 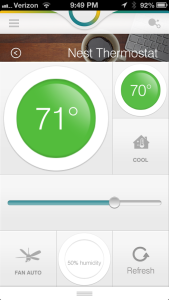 This entry was posted in Blog, SmartThings and tagged Nest, SmartThings on July 15, 2013 by Juan Risso. Audible Notifications will deliver notifications base on possible scenarios like the “The laundry is done” or “Mail Arrived”. The idea is to send a notification to the device that will play a specific mp3 file stored on it. For example, if the laundry is done, the device will play a voice saying that we should check the laundry. For it I used an Arduino Duemilanove, a SmartThings Shield and a Sparkfun MP3 Shield. Imagine the possibilities when you connect this to SmartThings and IFTTT. This entry was posted in Blog, SmartThings and tagged Notifications, SmartThings on July 2, 2013 by Juan Risso.